Back in the days when I started hunting and shooting we used the only available range-finders we had – our eyeballs. If you planned to shoot your high powered rifle out beyond two hundred yards then you really needed to spend the time and energy physically looking at objects that were a known distance away and training your eyes and mind to remember what that distance looked like. I suggest that nowadays, despite all the available new technology that this basic requirement holds true. So although it’s possible to avoid the training and carry a range finding device it’s a lot better to buy the best range finding device you can afford and use it as a part of your training. When it comes to making that shot of a lifetime you might just not have time or opportunity to whip out that range-finder and get a range calculation. You may not be able to risk movement at all. In the world of optics the name Leica is one that means the best that money can buy. Leica have a long established reputation in creating best quality optical equipment and have worked hard over decades to earn that reputation and to keep it. So their new for 2015 model CRF 1000-R at less than six hundred US dollars is a lot of optical device from a near legendary manufacturer for not a lot of money. 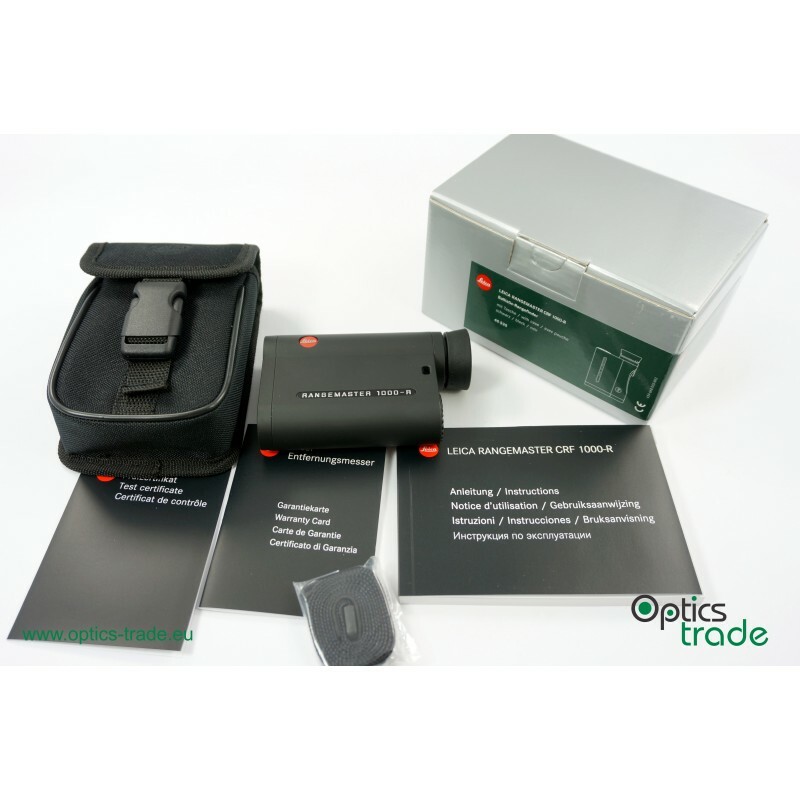 To get an idea of what your modest amount of US dollars will buy you have a look at the following review video from Optics Trade in Europe. 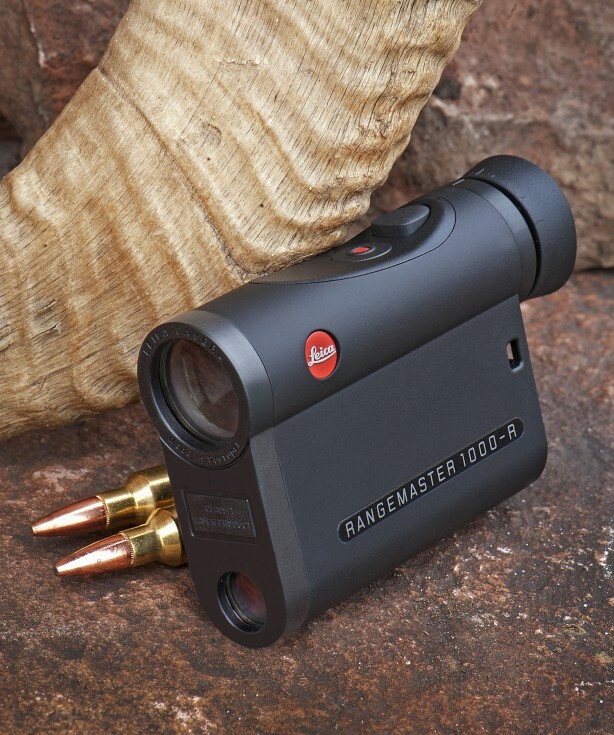 This is a range-finder that is small enough to comfortably fit into a typical front trousers pocket, but that has accuracy, intuitive usability, and dependability. It will even stand being submerged into metre deep water. The CRF 1000-R gives accurate range measurements from ten yards to one thousand yards with an accuracy of ±1yard out to 400yards and ±2yards out to 800yards and beyond 800yards and accuracy of ±0.5% out to 1000yards. The CRF 1000-R can be switched to metric system measures and then it delivers accuracy of ±1m out to 366m, ±2m out to 732m, and then ±0.5% out to 915m. This is a perfect accuracy range for most hunting rifle applications. 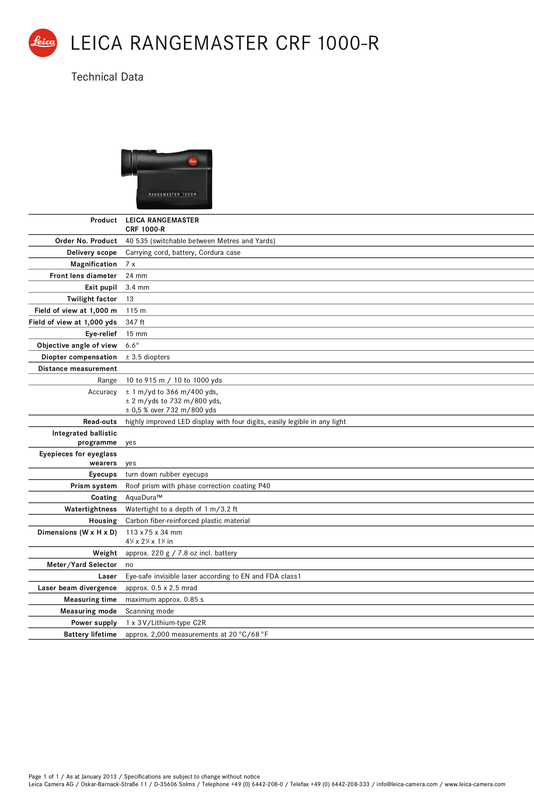 Full specifications for the Leica CRF 1000-R range-finder. To see the image larger right click on the image and choose “View Image”. (Courtesy Leica). The Leica CRF 1000-R has a number of nice features. The device is able to determine the angle of inclination between the shooter and the target up to 600yards (550metres) and provide aim correction information to enable the shooter to take a shot ethically and with confidence. The angle of inclination can be deceptive in hilly or mountainous country so having a device that can accurately determine it is very useful in those environments. The LED range and angle of information display is automatically adjusted and remain clear under almost all light conditions, dare I say all light conditions under which game may ethically and safely be taken. The magnification of the CRF 1000-R is 7x and it gives a nice big field of view of 347feet at 1000yards or 115metres field of view at 1000metres. This is a unit that won’t break your bank account and will prove to be both a valuable training tool and an invaluable asset when out on the hunt. US and international readers will find the Leica CRF 1000-R at Sinclair International if you click here. European readers will find the Leica CRF 1000-R at Optics Trade. (Picture courtesy optics-trade.eu). (Feature image at the head of this post courtesy Leica and touchpoint-management.com).